Children are always ‘getting it right’—Skills are carefully built from the bottom-up, with vast amounts of over-learning. When reading becomes a ‘can-do’ activity, children become eager learners, and they start to connect with whole-class activities. They join the club—they are no longer left in a bewildering fog of failure. Speaking and listening skills improve rapidly—One-to-one teaching is essential for children with learning difficulties. With Bear Necessities, all language skills develop quickly with just ten minutes per day. 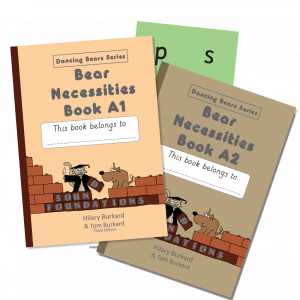 Anyone can use it—In our pilots, Bear Necessities has been used by Teaching Assistants, Governors, and other parent volunteers. You just pick up the child’s workbook and start where you left off the day before—ideal for schools that have part-time staff. Eliminates the need for long-term support—Most children are reading above their age after one term’s intervention—very few children will ever need individual support again. And for children with complex learning difficulties—the ones who can’t even remember their letters after the most exacting introduction to Jolly Phonics—we have the answer: Bearing Away. It is now being piloted by schools in Suffolk, Gloucestershire, Lancashire, and Scotland.